With Yuki’s dad back in Japan her mom wanted to make some home-style comfort food. Unsure of what to make I suggested Nikujaga. I’ve made Nikujaga before, and it turned out pretty tasty, but I wanted to try Tamiko’s since she has a lot more experience making it than I do. 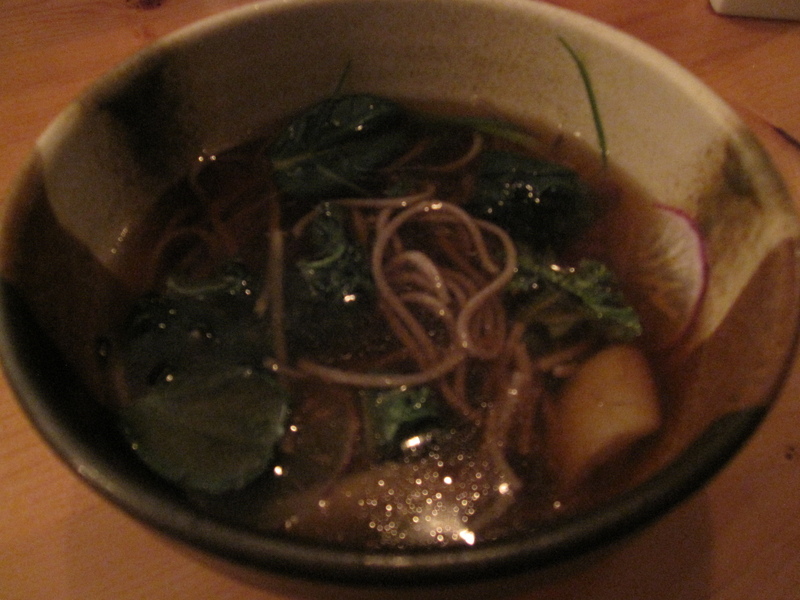 The basics are the same…beef and potatoes simmered in dashi with soy sauce, sake, and mirin. I’m not sure what her ratio for the broth was, but it was perfect! For mine, I used yukon gold potatoes, she used fingerlings (only because that’s what we had in our kitchen). Also, she used snap peas instead of the edamame in mine. Otherwise, they were pretty similar (both had carrots, a staple in any Nikujaga), only hers was definitely more refined than mine. 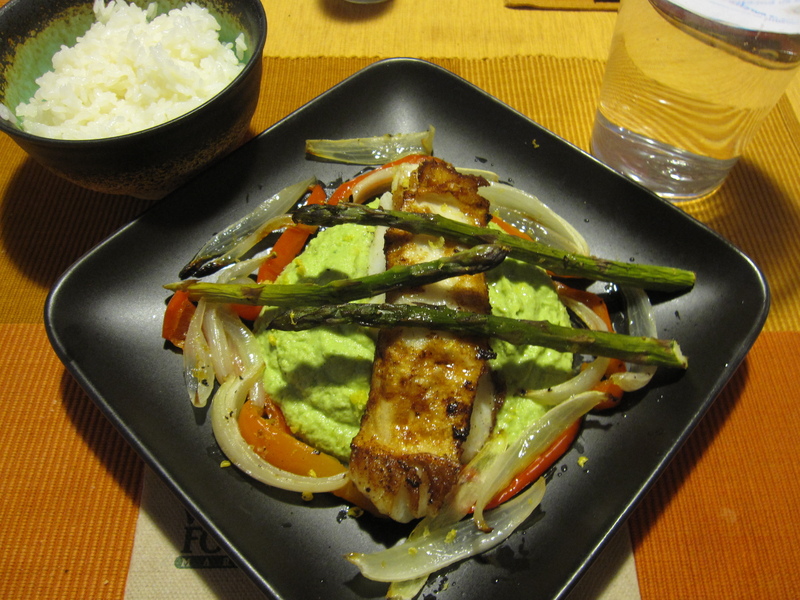 For a side dish she had me grill some sawara steaks. 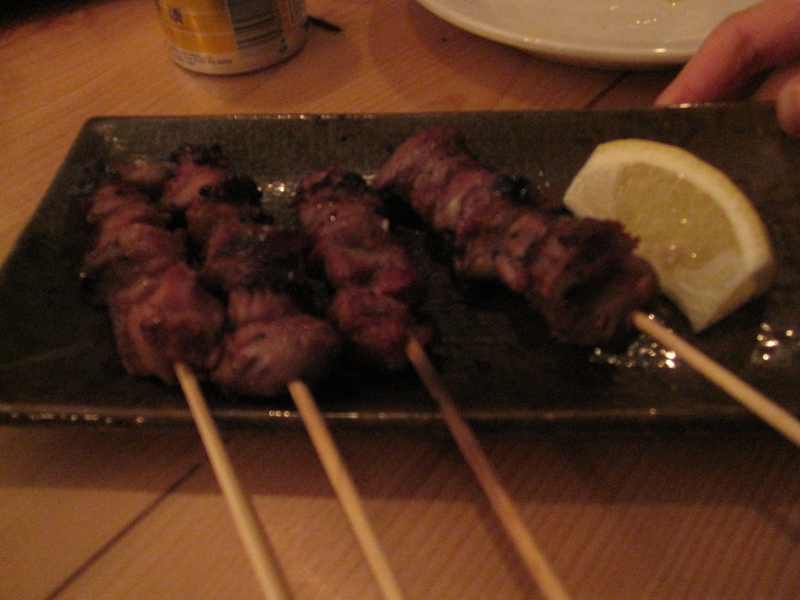 Sawara is Spanish Mackerel and we found some really nice steaks at Tensuke Market. Tamiko simply sprinkled it with salt and pepper. All I did was throw it on the grill for about 6 minutes each side. For the sauce, she mixed yuzukosho with some mayonnaise. Yuzukosho is one of my new favorite things! It’s yuzu mixed with pepper making it a citrusy spice that keeps my taste buds begging for more! She also made a simple miso soup with wakame and tofu. Being a Japanese comfort meal, white rice was also served. Restaurant Week started here in Chicago this past Friday. Unlike last year where Yuki and I ended up going to 6 or 7 different places we’ve decided to only do 2 this year. 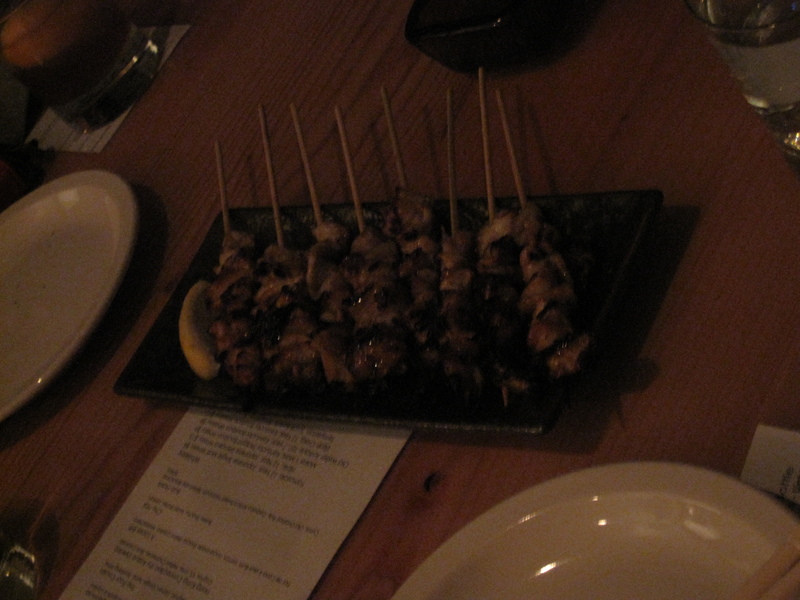 We started off Saturday night at a place that’s been high on our list of places to try for a while but never got around to hitting up…BOKA. Located in a very sheik area of Lincoln Park we were a little concerned it’d be a little too pretentious for our tastes. What happened though, is that our tastes were pleasantly surprised. I know that Restaurant Week menus don’t fully show off all of a chef’s skills, but it does do a good job of giving an idea of what a particular chef is all about. I really dig what Chef Tentori is all about. You gotta love an Italian who effortlessly blends Asian flavors with French techniques. I used my phone’s camera again, and of course, in dark lighting it does a terrible job. Just let your imagination go wild with my descriptions. You can also check out the menu they have posted on the Restaurant Week website, just know that those menus aren’t completely accurate. 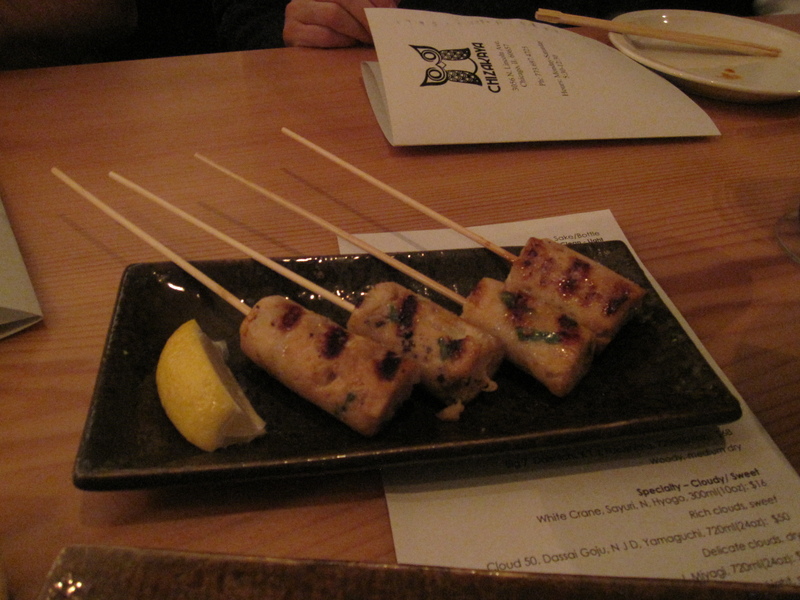 Yuki started off with the Maine Diver Scallop. 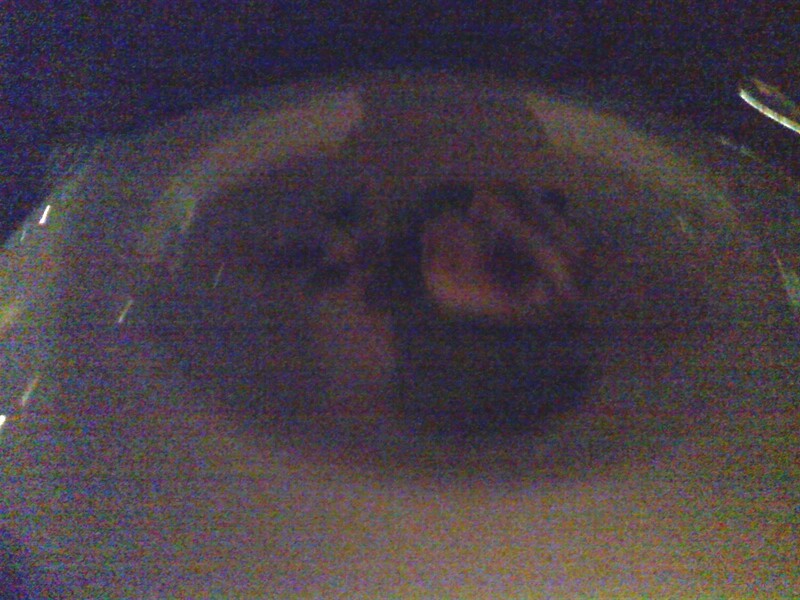 A big juicy scallop with a perfectly cooked crust served with some sort of bean puree (tasted like it could have either been edamame or fava, don’t remember exactly what the server said) and forbidden black rice. 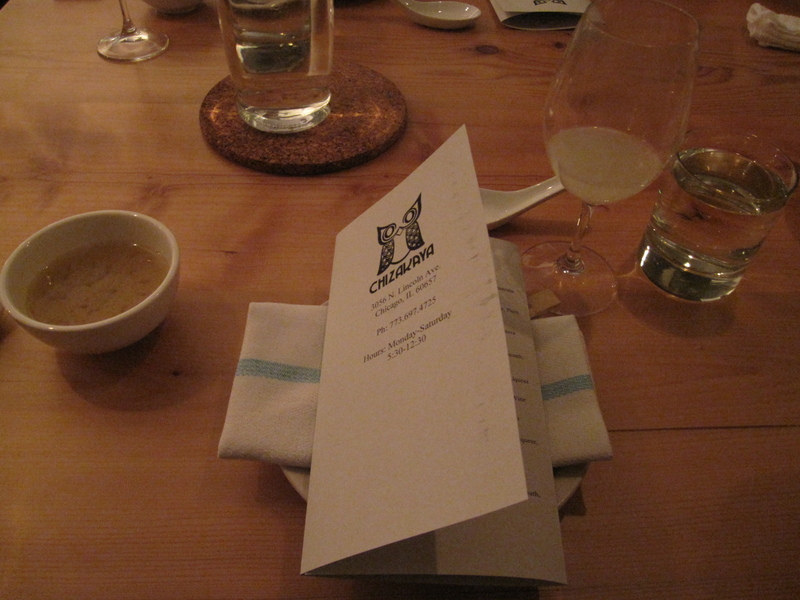 The flavors matched perfectly and the scallop was easily one of the best scallops we’ve eaten in Chicago. 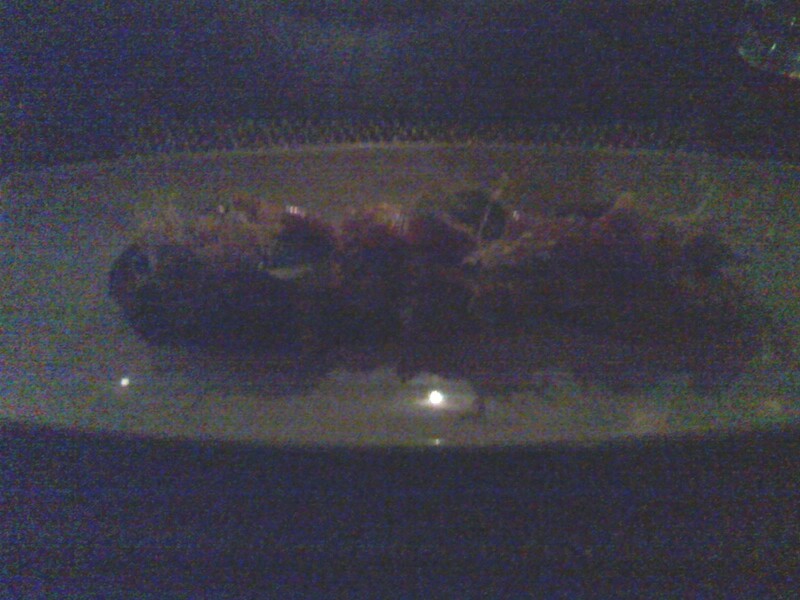 I started with the Beet Salad. Sweet, juicy golden beets with candied walnuts and frisee served on a blood orange sauce. It’s hard to get too creative with beet salads anymore since every restaurant in America serves one and this was not the most creative one I’ve ever eaten. It was, however, one of the best. 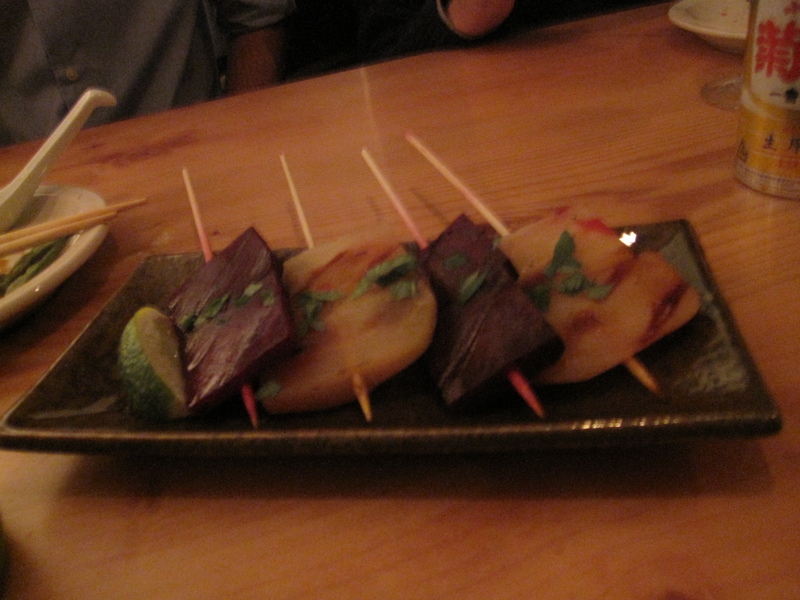 Chef Tentori kept it simple and let the sweetness of the beets take center stage. The crunch of the candied walnuts was the perfect match while the slight bitterness of the blood orange sauce countered nicely. 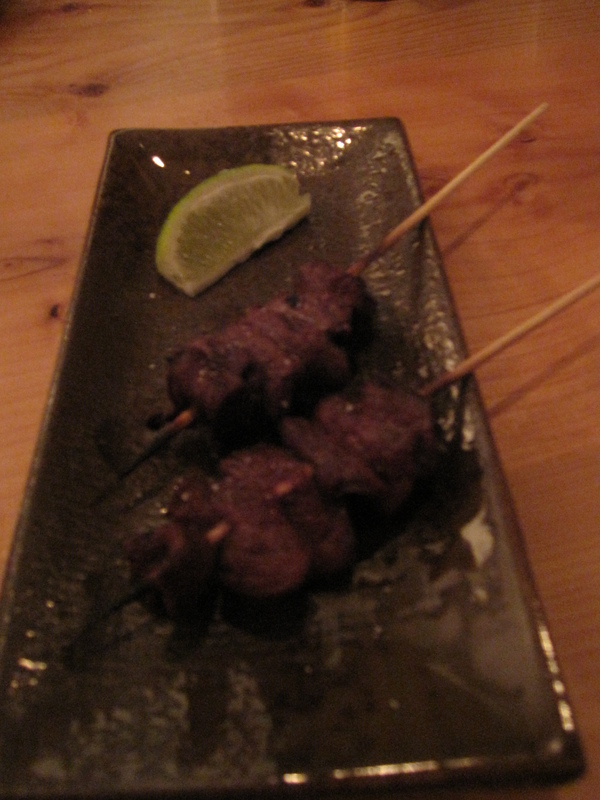 Yuki’s entrée was the Seared Angus Tenderloin. While Angus lost it’s luster as a brand the moment fast food chains started using head and hoof scrapings to make up the required 40% beef in their patties, this was the real deal. Tender, juicy, full of beefy goodness. 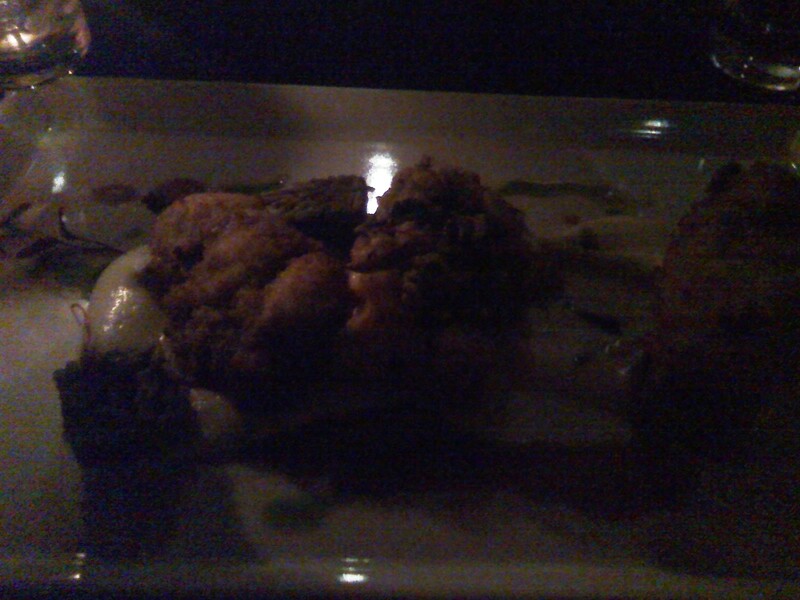 It was served with braised red cabbage, croquettes of wild mushrooms and some kind of cheese (the cheese gave a real nice barnyardy aroma and flavor the remind you that cows come from farms and not manufacturing plants), and a parsnip puree. Absolutely delicious. I got the Braised Pork Belly. 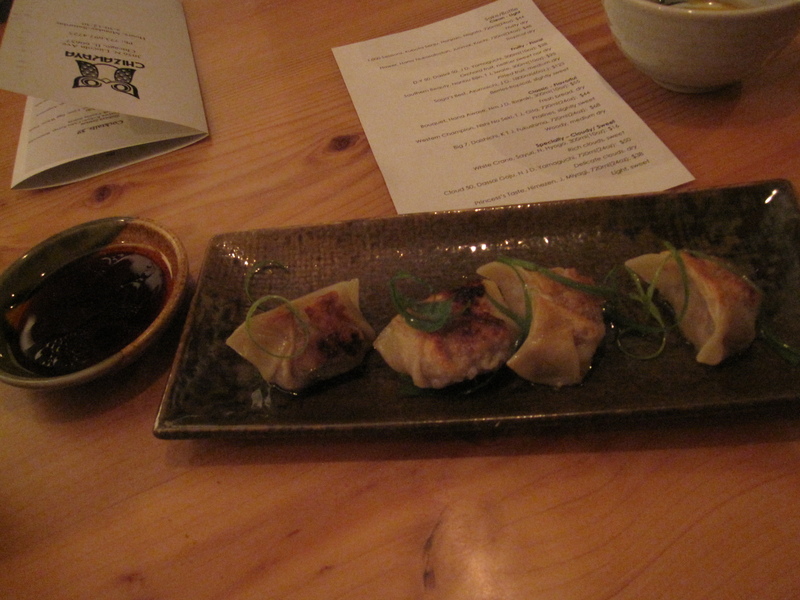 I’m very predictable, I usually get the beet salad and pork belly when I see them on menus. 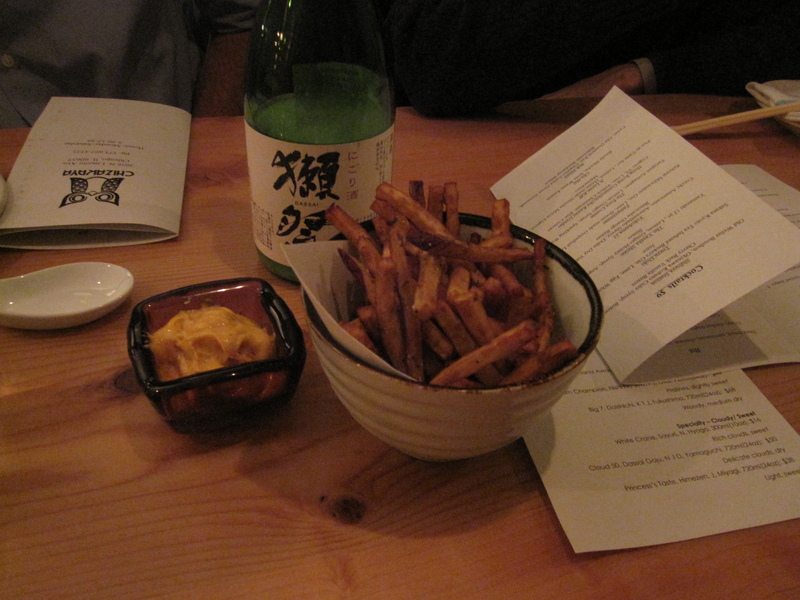 I’m glad I did at BOKA. 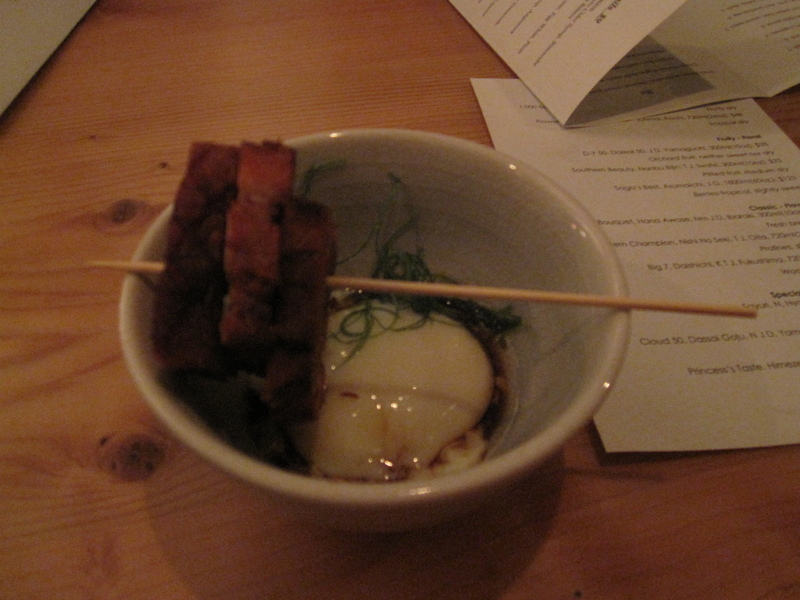 While most places will sear the pork belly before serving to give that crunch on the skin Chef Tentori didn’t. Instead he kept the whole thing soft and fork-tender. 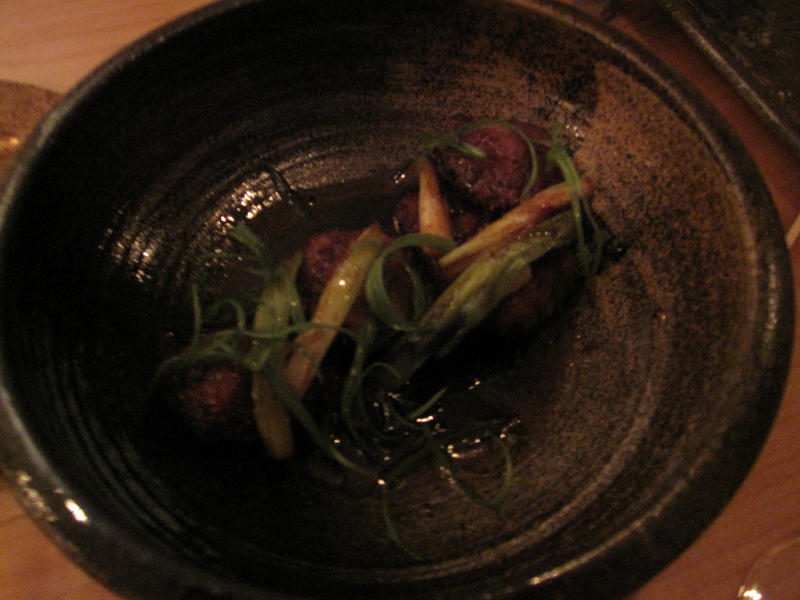 The texture was almost like a slow-braised brisket. I loved it! 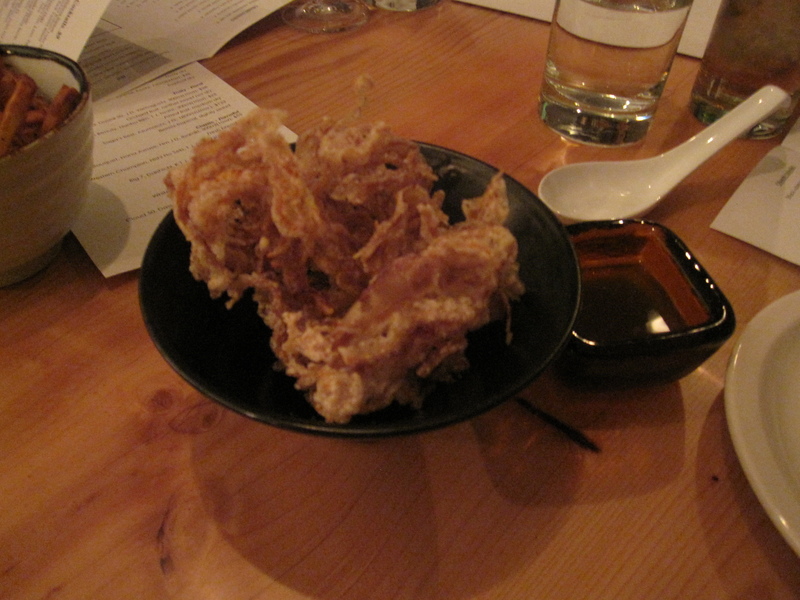 He served it with two huge deep-fried oysters, spicy bok choy, little green tea soba noodle cakes, and some sort of white vegetable puree (I think it was cauliflower). 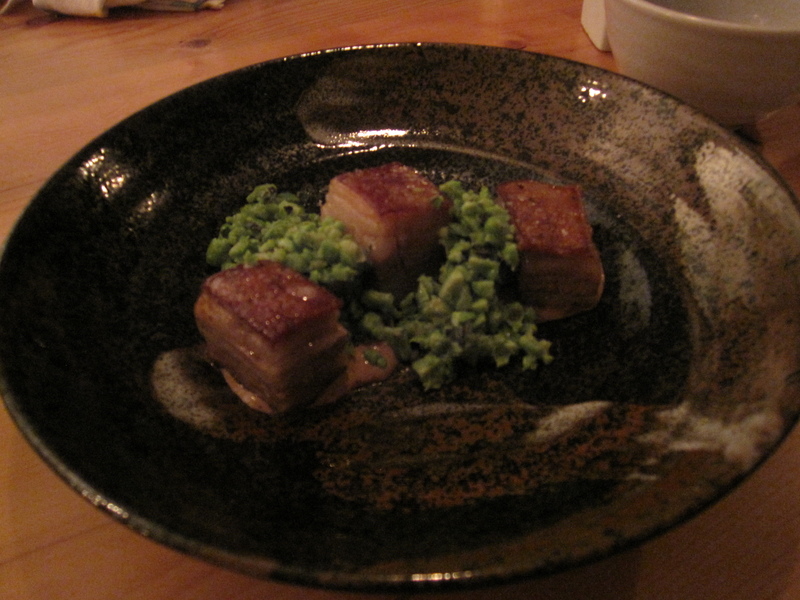 The flavors and textures worked really well together making this one of my favorite pork belly dishes (light years beyond that crap Naha served me last August). 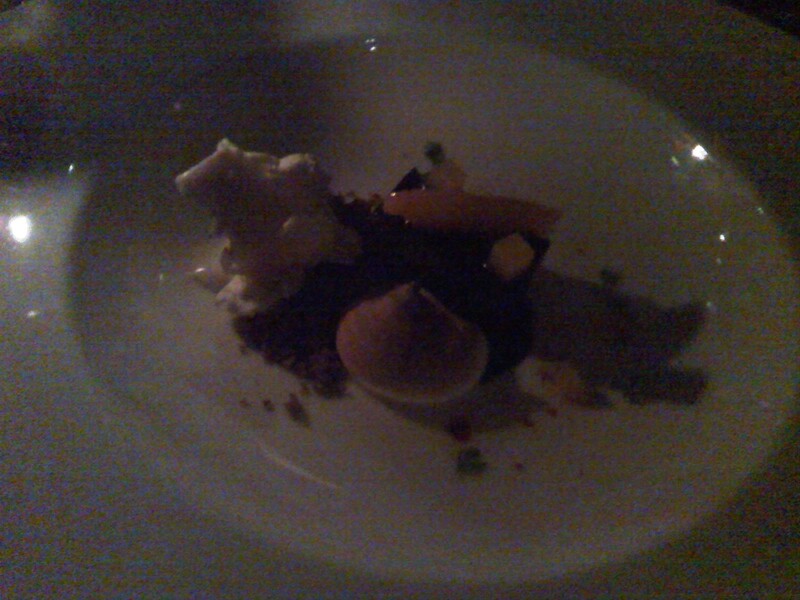 They ony offered one dessert with the Restaurant Week pre fixe, and that’s fine because it was a damn good one. 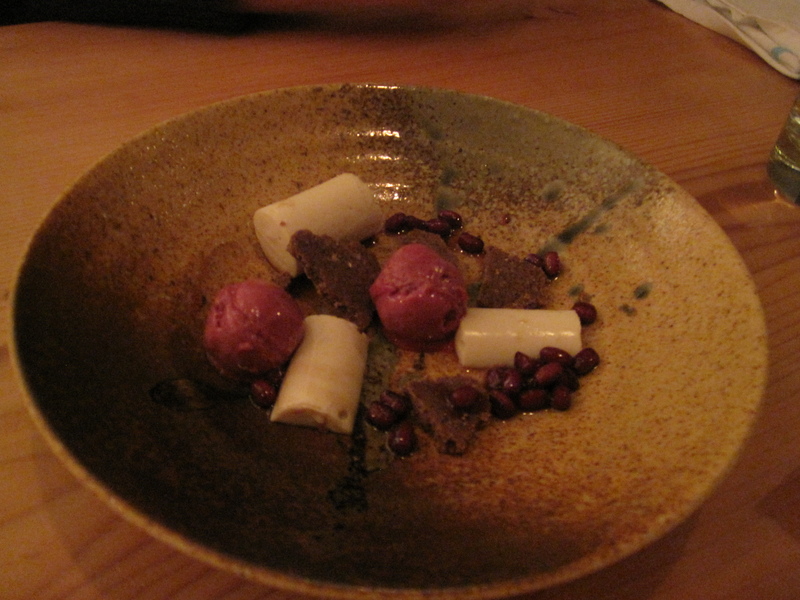 They called it Ginger Kulfi and served it with toasted marshmallow, ground espresso chips, chocolate fudge, and a tangerine segment. I think they got it backwards. The chocolate fudge was the star for me. 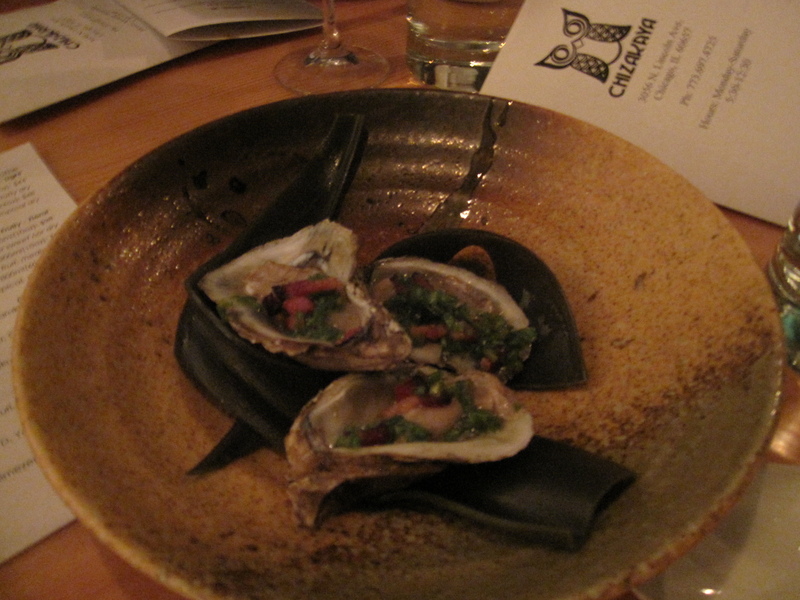 Everything else on that plate supported its richness and added depth to its flavor. 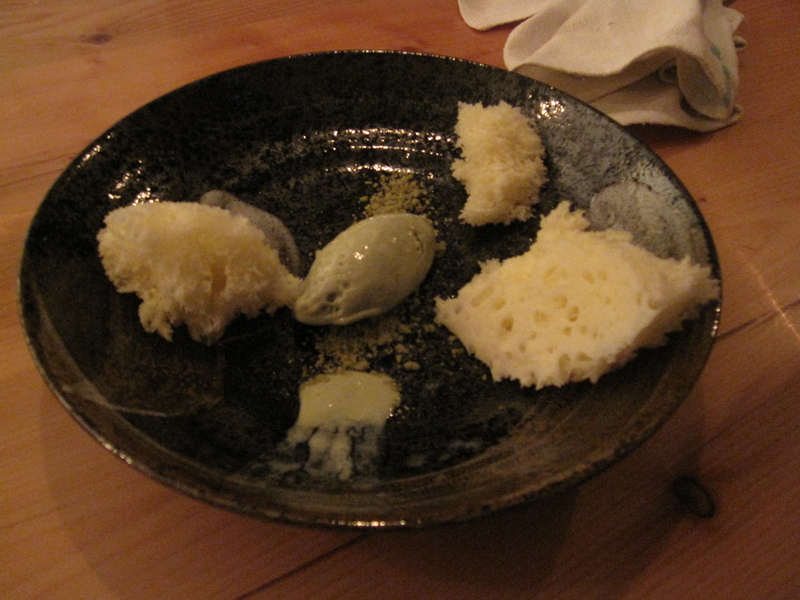 The kulfi was outstanding though…smooth, gingery, and creamy but not overpowering. 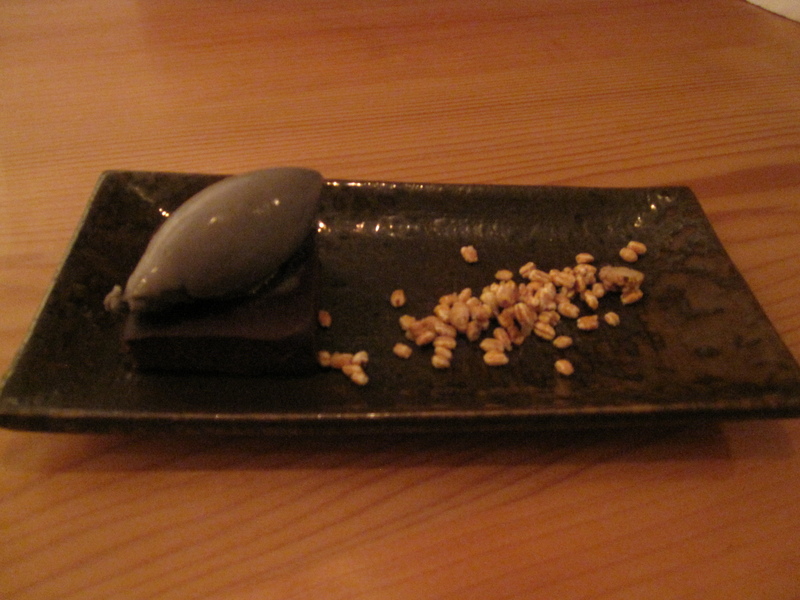 It was one of the more well-balanced desserts I’ve had at an upscale Chicago restaurant. Throughout the evening service was spot on as well. We were promptly seated in the covered courtyard (I think they use it for al fresco dining in warm weather). Our server was quick, knowledgable, and had a good sense of humor. The courses were well spaced and we didn’t have a lot of down time between them. 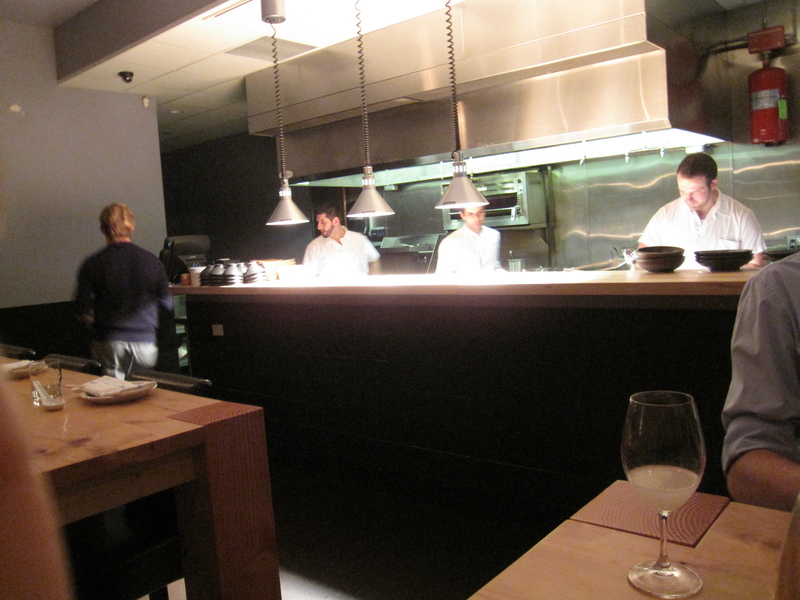 My only real gripe with BOKA is their IPod shuffle. 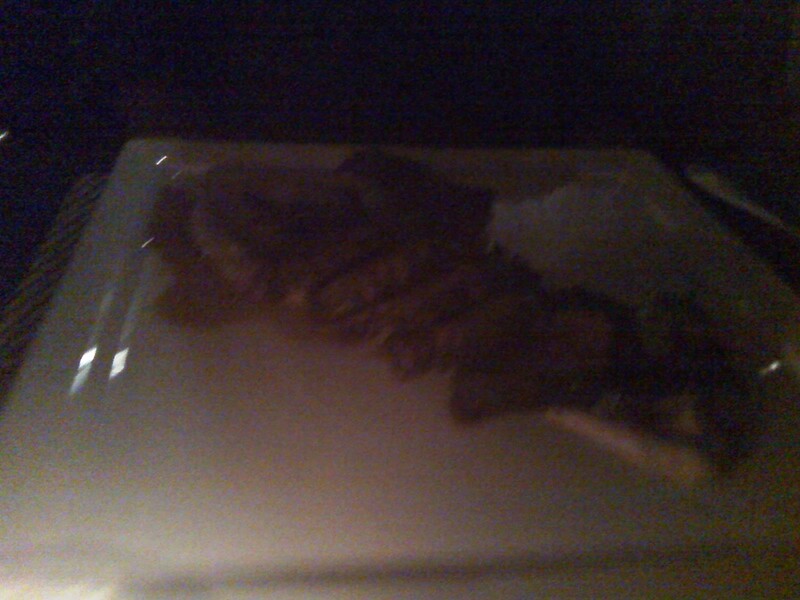 It went from Dave Brubeck and some great jazz to the same horrible soundtrack that most restaurants play. You know, that light techno that makes you feel like you’re trying on blue jeans at Banana Republic. Fortunately, it went back to jazz after a few techno songs. They really just need to stick with the jazz. But, when that’s my only gripe with a place it’s probably a pretty good place. 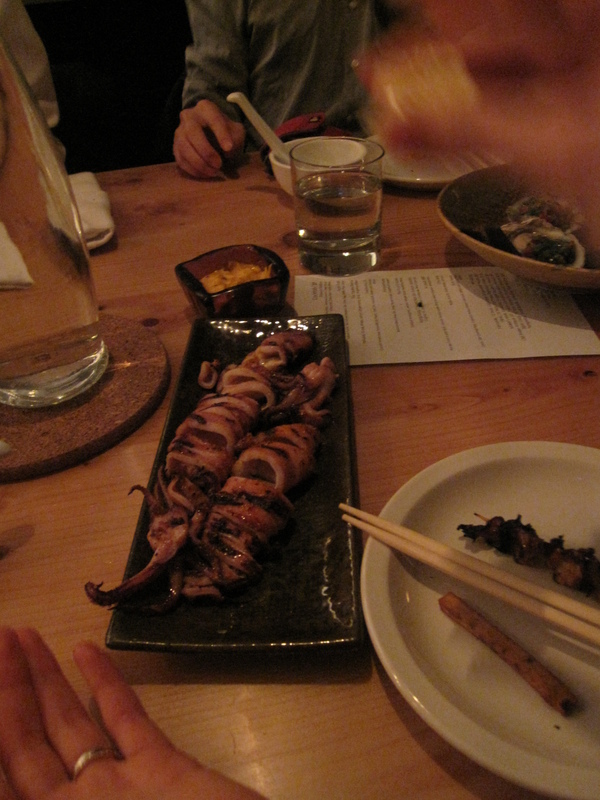 All in all, I would definitely recommend BOKA. 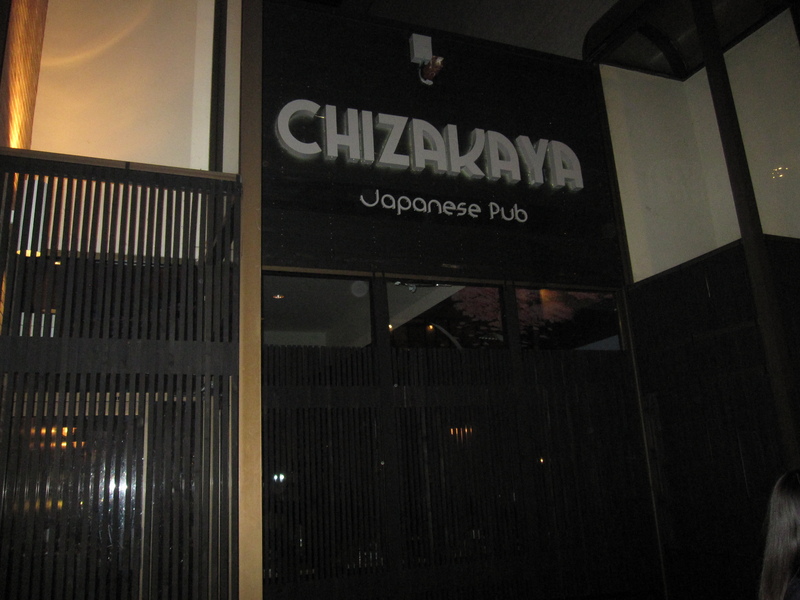 They were able to present us with an extremely professional and upscale environment with absolutely delicious food while keeping all pretensions out of the picture. A rare feat I must say. 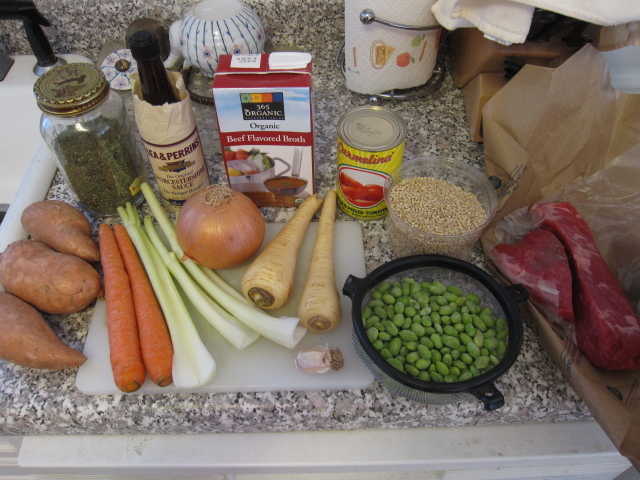 Last night I made a classic Beef and Barley stew. I didn’t quite make it using the classic ingredients though. Instead of potatoes I used sweet potatoes. 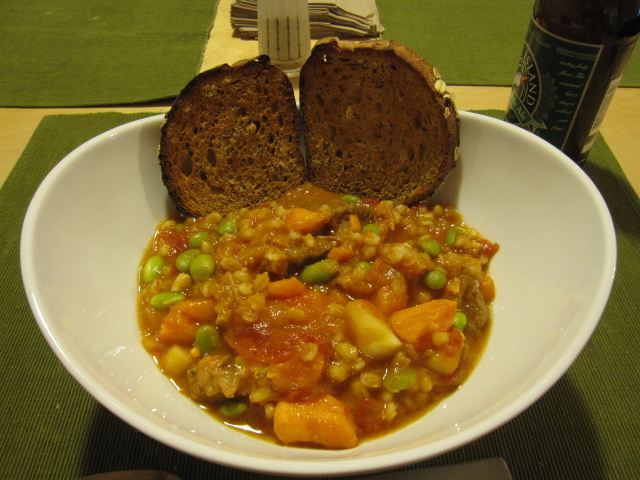 Instead of the popular pearl barley I used hulled barley. Instead of stew meat, usually beef from the round or chuck roast, I used brisket. Oh brisket, how I love thee! I did this for health reasons as sweet potatoes have more nutrients than regular ones and hulled barley is a whole grain that still has the germ, it has 8 essential amino acids. While brisket isn’t any healtheir than typical stew meat it’s all about flavor and texture. My ingredient list included 3 medium sized sweet potatoes skinned and chopped, 1 tablespoon of dried oregano, 2 medium sized carrots chopped, 3 stalks of celery chopped, 1 tablespoon of worcestershire sauce, 1 onion chopped, 2 cups of beef stock, 2 medium sized parsnips chopped, 5 cloves of garlic diced, 1 14oz can of peeled whole tomatoes, 1/2 cup of rinsed hulled barley, 2/3 cup of edamame, and 1 pound of brisket cubed. Not in the picture are 1 tablespoon of flour, 2 bay leaves, and 2 tablespoons of olive oil. I started by heating up my stock pot. Once hot I poured in the olive oil, added the brisket, and sprinkled the flour on top. 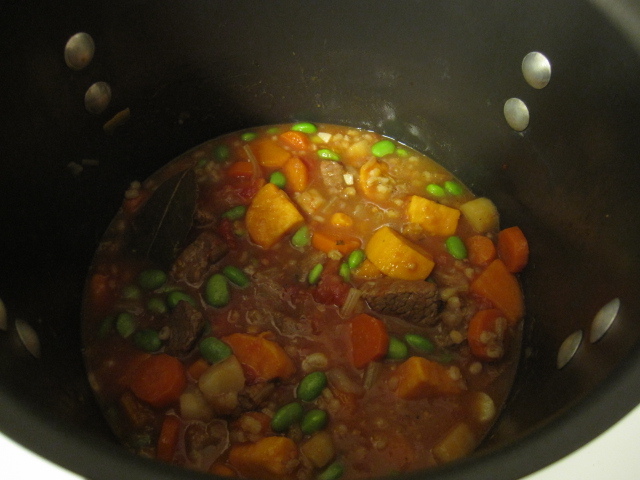 I stirred it all around just until the surface of the beef turned brown and no longer pink. 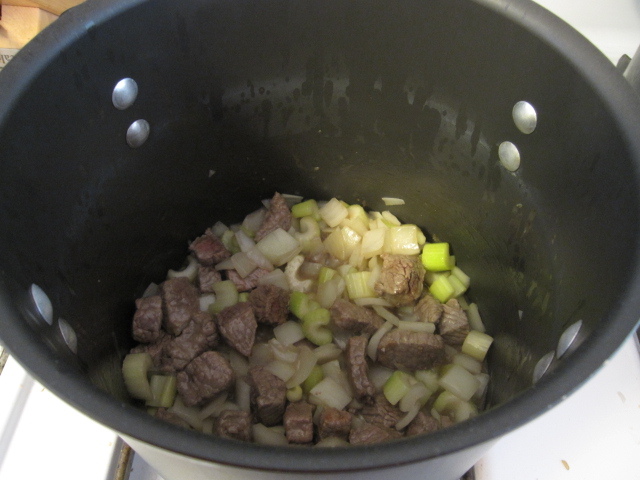 Then I added the onion, celery, and garlic and sweated them down for about 5 minutes. After that I poured in the stock, added the bay leaves, brought it up to a boil, covered, turned the heat down, and let it simmer for about an hour. 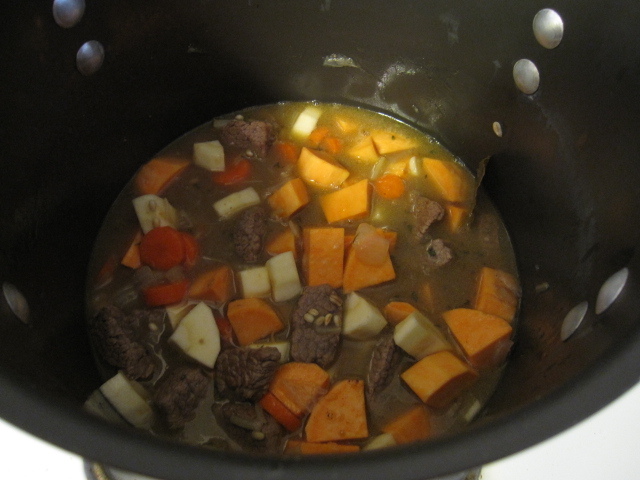 Once the hour passed by I tossed in the barley, sweet potatoes, carrots, parsnips, worcestershire, and oregano. I let that come back to a boil and let it simmer for another 45 minutes. Finally, I added the edamame and tomatoes with their juice. I took each tomato out one at a time and broke them up with my hands as they dropped into the stew. Once everything was mixed in I seasoned with salt and pepper and let it stew for about 15 more minutes to bring it all together. A couple slices of toast, a bowl of hot beef and barley stew, and a nice cold beer and that’s all she wrote. The Top Chef finale was on the other night and I noticed something from watching it this season…every time someone made a pea puree they won the challenge. With that in mind I decided to make my own pea puree to eat while watching the finale. Instead of using green peas though I used edamame. To make the puree I started with 1 cup of frozen shelled edamame, 1/2 onion diced, 1 lemon zested and juiced, 1 garlic clove minced, 1/3 cup soy milk, and a handful of cilantro. In a heated pot I poured about 1 tablespoon of vegetable oil and tossed the onion in. I let the onion sweat over medium heat for about 5 minutes and then added the garlic. About 1 minute later I added the edamame (it was still frozen when I added it). It only took about 6-7 minutes for the edamame to heat through, at which point I turned off the heat and let it cool down for about 10 minutes. 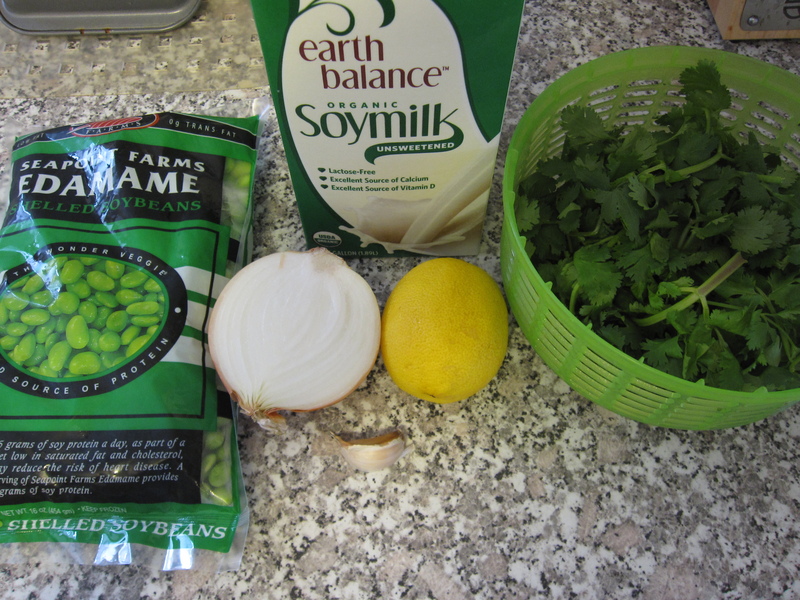 I put the edamame mixture in my blender and added the cilantro, soy milk, 1/4 of the lemon zest, and half of the lemon juice. While blending it I noticed that it needed a little more liquid to get a nice smooth puree. After tasting it, I decided to add about 1/4 cup of orange juice instead of more soy milk, it needed a little sweetness to it. Once I got the thick, smooth texture I wanted I seasoned it with salt and pepper and poured it back into the pot. I gently re-heated it when it came time to serve. 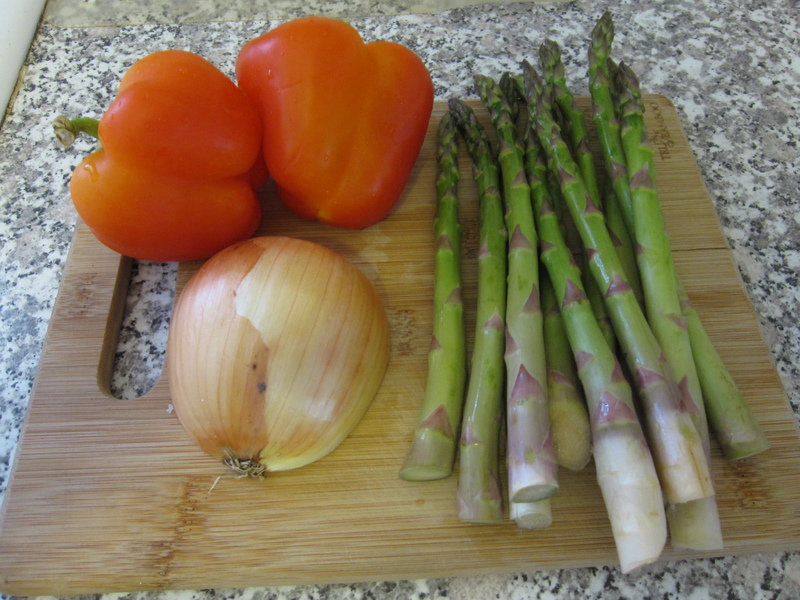 Before cooking the halibut I got some vegetables ready. I sliced one red bell pepper (decided to only use one of them, I’ll use the other one tonight) and the half of the onion from the puree. I also cleaned up some asparagus. 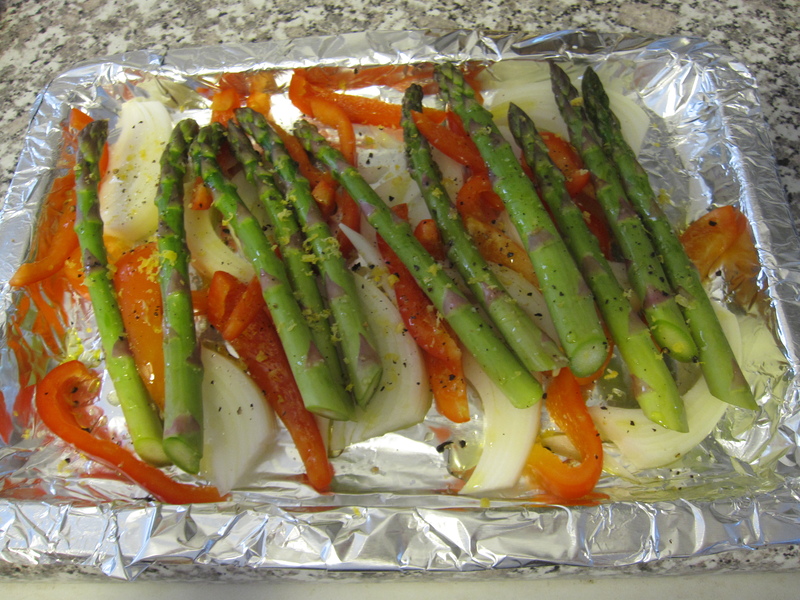 I simply laid the vegetables on a roasting tray, drizzled some olive oil on top, seasoned with salt and pepper, and then sprinkled about another quarter of the lemon zest on top. This all went into an 350 degree oven for about a half hour. 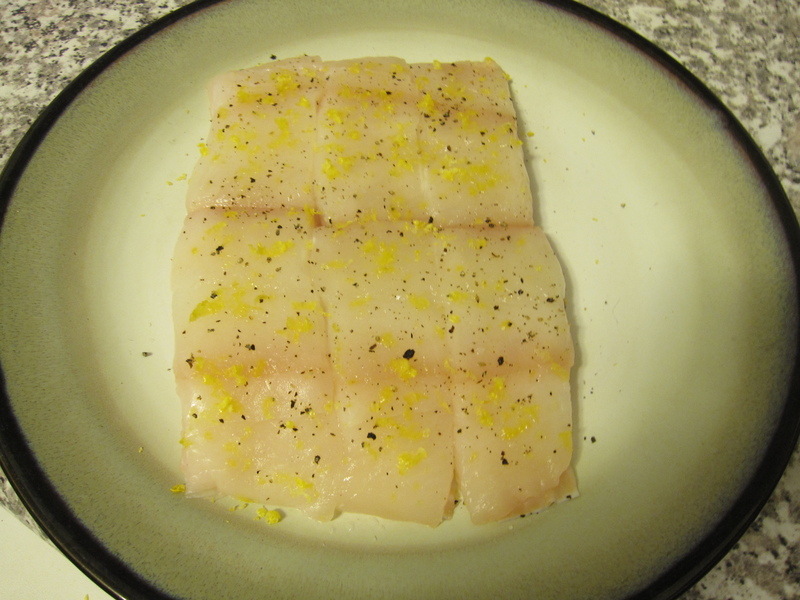 For the halibut I used three 4-5 ounce filets (I still had meatloaf leftovers for my lunch so I only needed lunch leftovers for Yuki) and seasoned them with salt, pepper, and the 3rd quarter of lemon zest. In a large skillet over high heat I poured in about 1 tablespoon of vegetable oil and then dropped 1 tablespoon of butter in. I laid the filets in skin-side down and let them go for 5-6 minutes, until the skin was golden brown and crispy and released from the pan with ease. If the fish doesn’t release easily then it’s not ready. Once it was ready I flipped it over and let the other side go for about 5 minutes until it released easily. To serve, I laid the halibut on top of some puree, laid the vegetables all around, and then sprinkled everything with the rest of the lemon zest and juice. White rice on the side. 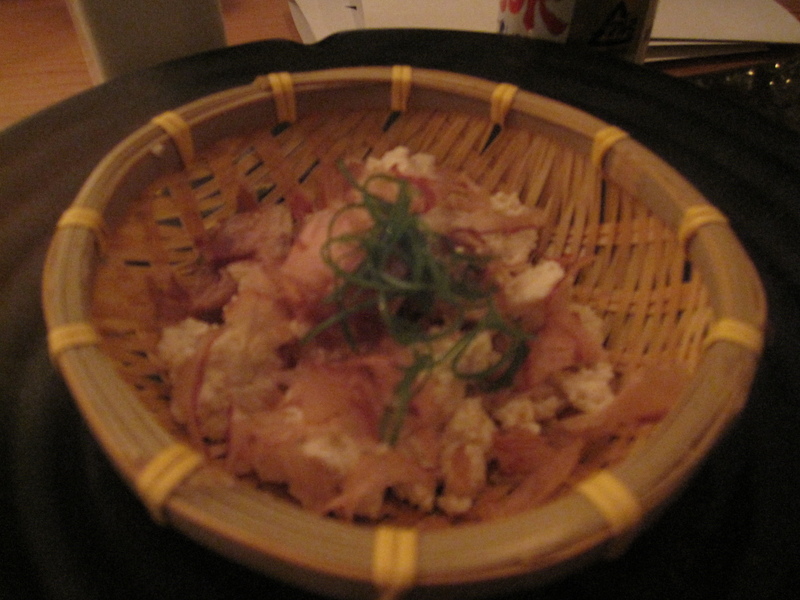 The other night I tried my hand at making a classic home-cooking dish from Japan, Nikujaga. 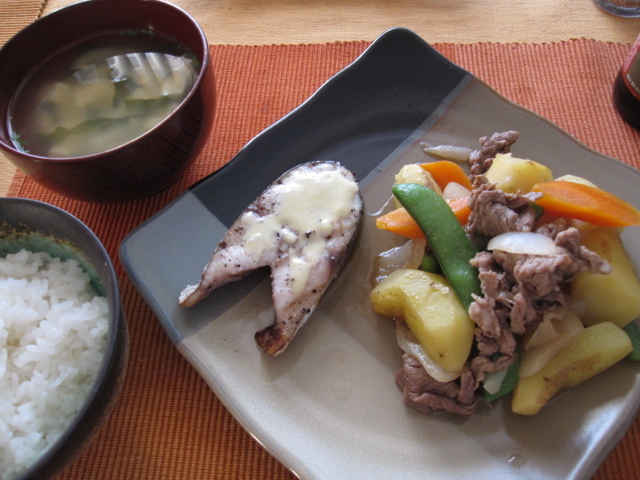 It is a stewed meat and potato dish that is the definition of Japanese comfort food. There are about as many different ways to make it as there are Japanese mothers (and Jewish husbands who cook for their Japanese wives). 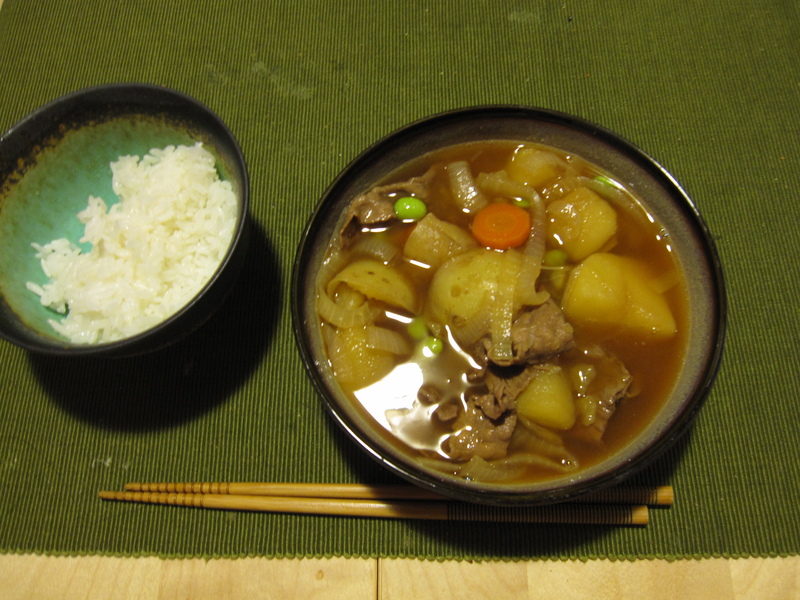 The basics of Nikujaga are thin slices of beef (can use pork for variation), potatoes, and onions that are simmered in a sweetened soy broth. Frequently there are other veggies added such as carrots and peas or green beans. It’s really very easy to make as well as being healthy and delicious. It’s the perfect meal for a winter’s eve when served with white rice. I made it using about 2 cups of water, 1/3 cup of soy sauce, 1/3 cup of mirin, and a couple tablespoons of sugar as the broth. I threw that all into my pot with about a pound of large chopped Yukon Gold potatoes. I brought that to a boil and let the potatoes soften for about 20 minutes. It’s best to put all of that in the pot with the potatoes cold and bring to a boil together so that the potatoes absorb more of the flavor. 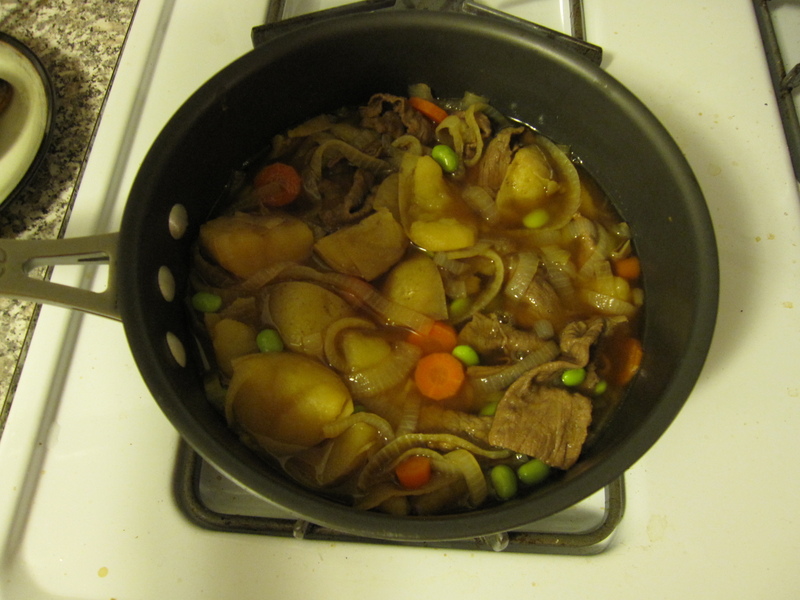 Once the potatoes were partially cooked I added about 2/3’s of a pound of thinly sliced beef. After that boils for a few minutes I skimmed off the foam that forms from boiling raw meat, much like I do when making chicken soup. The foam isn’t bad for you or anything, but by skimming it off you get a clear broth. After the meat simmered for about 5 minutes or so I added a thinly sliced onion along with a sliced carrot. I simmered those for about 10 minutes. I just wanted them softened, not fully cooked, so that there was still some texture left in them. Then I threw in a bunch of shelled edamame. Those don’t need to cook since they’re small and already cooked when you buy them. They just need to be heated through so they go in towards the end. After they’re cooked through I thought I was finished and proceeded to serve up the meal. However, I forgot the last ingredient that I wanted to put in, shirataki. 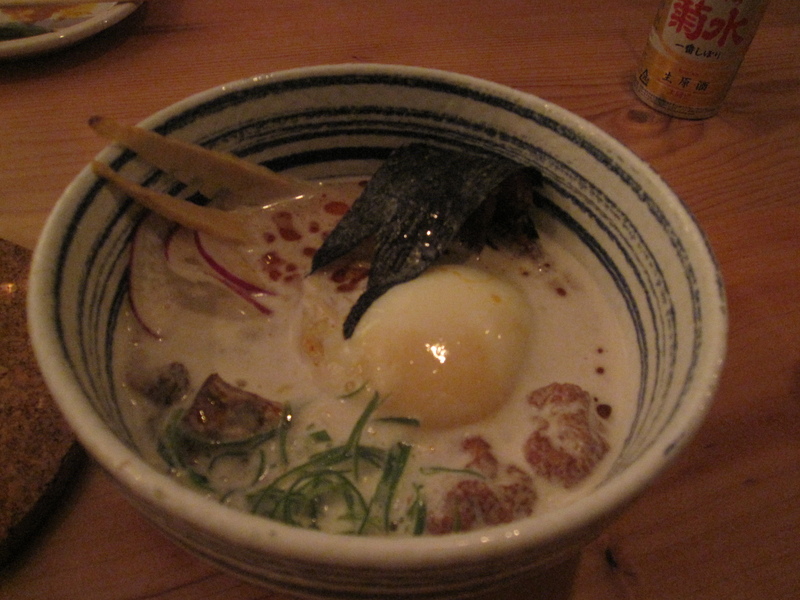 These are clearish-white “noodles” that are made from the starch of a yam-like vegetable. It’s the same substance as konnyaku, but in noodle form. They don’t need to be cooked, just heated through. They come in a package in liquid. Drain the liquid, rinse them off, cut them into smaller pieces, and throw them in to the stew for a few minutes. Unfortunately, I forgot to take a pic with the shirataki in the Nikujaga. Just imagine some opaque noodles in the stew and you’ll get the idea. If you follow my recipe you’ll end up with about 4 servings. The only suggestion I would make, and it’s something that I’ll do the next time I make it, is to use Russets instead of Yukon Gold. Russets will stand up to the long stewing a little better as their a little more dense. After Yuki ate the Nikujaga she gave me probably the best compliment I could have received. She said that her mother would definitely enjoy eating it. Knowing her mom and what a great home cook she is, that’s pretty high praise. I am now officially a Japanese mother! I may be the only Japanese mother in the world who is actually a Jewish husband without any children. That’s all part of my charm.